Boston has many historical, beautiful, interesting and even quirky doors. They open onto amazing places, some public and some private. While interior spaces tend to get all the attention, doors can be pretty fascinating all by themselves. Take the Salada Tea Doors, for example. I wrote about them in 201x as part of my series on Boston’s Hidden Gems and they are among the best of Boston’s doors. 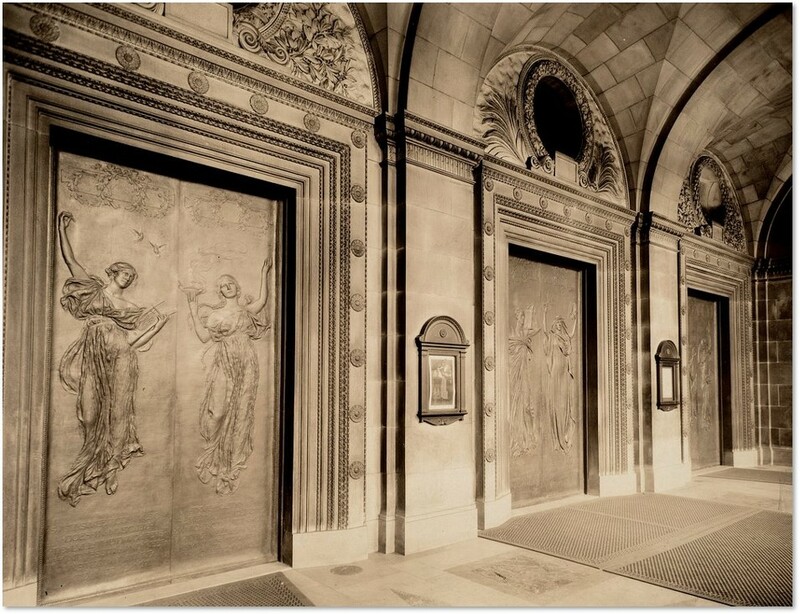 Today I’m going to focus on six bronze doors that lead from the vestibule of the Boston Public Library’s Central Library to its spectacular lobby and grand staircase. 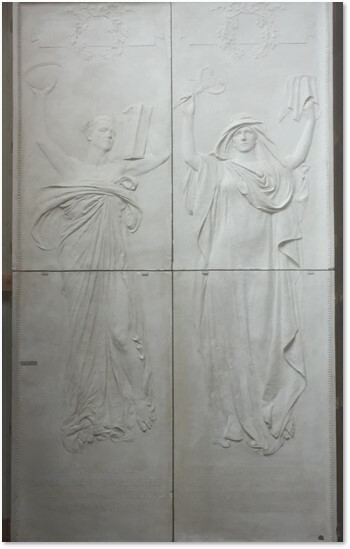 The three sets of tall doors, were designed by Daniel Chester French, the sculptor who created the Angel of the Waters in the Boston Public Garden and five memorials in Forest Hills Cemetery. 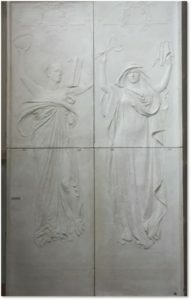 He sculpted these doors about 25 years before he created the statue of Abraham Lincoln in Washington DC’s Lincoln Memorial. Each of the BPL’s doors weighs 1500 pounds but you don’t actually have to open them. They stand open during library hours–which makes it easy to walk right past without really looking at them. If the left and right pairs are closed, the central doors of Knowledge and Wisdom are always open. 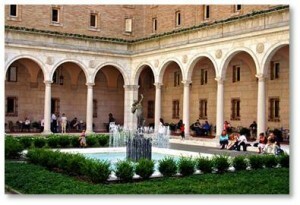 The Boston Public Library was designed to be “the people’s palace” and the doors are just one of the many artistic and visual treasures to be found inside. You can see them just by walking in during library hours but the best way to appreciate the BPL’s works of art is by taking one of their art and architecture guided tours. These tours cover both the original structure—the McKim Building—and the 20th century addition designed by Phillip Johnson. Along the way, you will see murals by Edwin Austin Abbey, Pierre Puvis de Chavanne and John Singer Sargent, and sculpture by Frederic MacMonnies and Augustus and Louis St. Gaudens. To find the maquettes, or models, that Mr. French made for the doors you have to drive out to the Berkshires and visit Chesterwood, Daniel Chester French’s summer home and studio in Stockbridge, Massachusetts. The sculptor spent 34 summers working at Chesterwood. The house is beautiful with a wonderful view from the porch. But the studio holds examples of Mr. French’s work in full size and in miniature. The studio has a very high ceiling to accommodate his work on large pieces such as equestrian statues and the BPL’s bronze portals. It is well worth the visit to get a closer look at how he approached his creations. 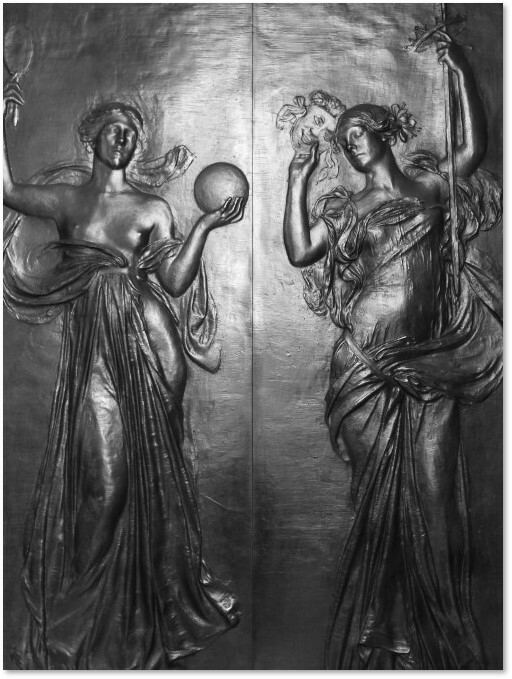 This entry was posted in Art and Museums, Boston, History and tagged Boston Public Library, BPL, bronze doors, Chesterwood, Copley Square, Daniel Chester French, maquette by Aline Kaplan. Bookmark the permalink.